Chronicles of Nushy: (Rant) Screw this Nambu line! Sometimes people are so mad about this system, that they sneak through the gates. You can easily lift it up an go through. I've done that in the past. It is not insecure because the trigger points are far away. I had to wait like 1 minute for the train to get to the station. I could have sneaked through, but I didn't feel like doing it. Nobody did so. If anyone attempted it, I might have too. This system is completely secure. System failure is unheard of. But people do jump on to incoming trains when they feel that they cannot go on any longer. That's different. The town has two options. Build a overhead crossing or build another entrance to the station from the other side. I like the latter because it cuts the distance to the station by almost 30% for us. But anything is welcome at this point. You have no idea how many man hours get wasted because of this everyday. Now, that's only 2 trains. What about 3 trains or even 4 trains trying to screw you up? I've seen 3 trains (one coming from B, then another coming from A just before the gates opened, and another managing to sneak in from B before the gates opened. One day, there was a delay in trains and few trains came one after another and 4 trains arrived at the station at the same time!!! At least, it happened in the evening when I was going home. If it happened in the morning, there would have been so much chaos. 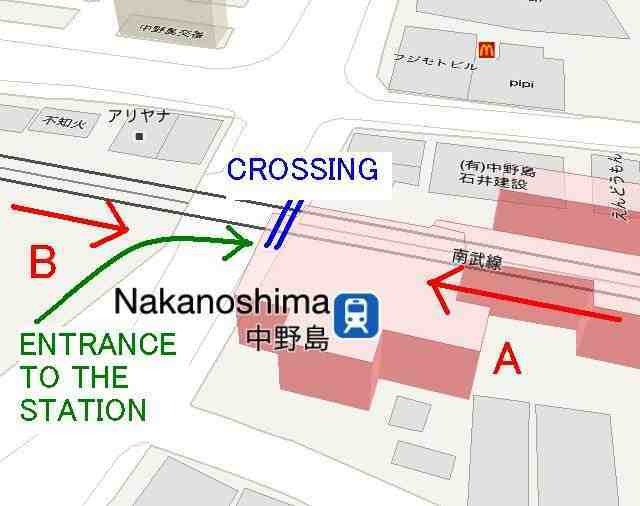 Nambu line is not a important line. It just connects the main lines like in a H shape. The vertical lines and main lines and the horizontal line is the Nambu line. This issue probably isn't there with other lines because a lot of them goes underground or overhead or the have overhead crossing or even underground crossing. And those stations have many entrances. Doesn't metro have corssings inside the station? They were there in BKK and SIN. we can even cross the highway, still being under the road and inside the station. No this is not metro. This is a normal poor man's railway line. We don't live in the city. This is just a town, say, like Piliyandala compared to Colombo. Nambu line is not a main line. It is there just to connect the main lines.